My Duffy as only stuffless toys.. He even tore the stuffing out of his bed. Tennis balls last a day or two but his stuffless buddies have lasted. I can split a Petsmart frisbee in half (down the middle) in 30 minutes. To hell with fetching it-let Them pick up the pieces. Floyd is our resident de-stuffer! I never get the chance! So glad to find another dog that tears their toys to bits! Mine last for only a minute or two until there is fluff everywhere. Mum tried to get me the more durable ones, but guess what? I don't like playing with those one. Winston is only interested when other dogs are; Fiona, not at all. Both are rescues and I wonder(with a heavy heart) if sometimes they missed out on the joys of destroying toys. Mr. K, no worries. I am a rescue Scotty with not much interest in toys, nor does my 'sister' Finoa, care much for them-tally ho, old boy! SM must remember you were once upon a time a great hunter and we need to keep our skills! Kaci and I are rescues and no toy can defy us. Mom found these great toys (love the squeeky ones) online at Amazon. They have all sorts of shapes and sizes. My favorite are the chicken ones with a hidden squeeky. Ask you Mum for one. I think you'll both be pleased. Taylor's plushy toys last about 1 month, even when we give them to her at certain times each day (when we can supervise). 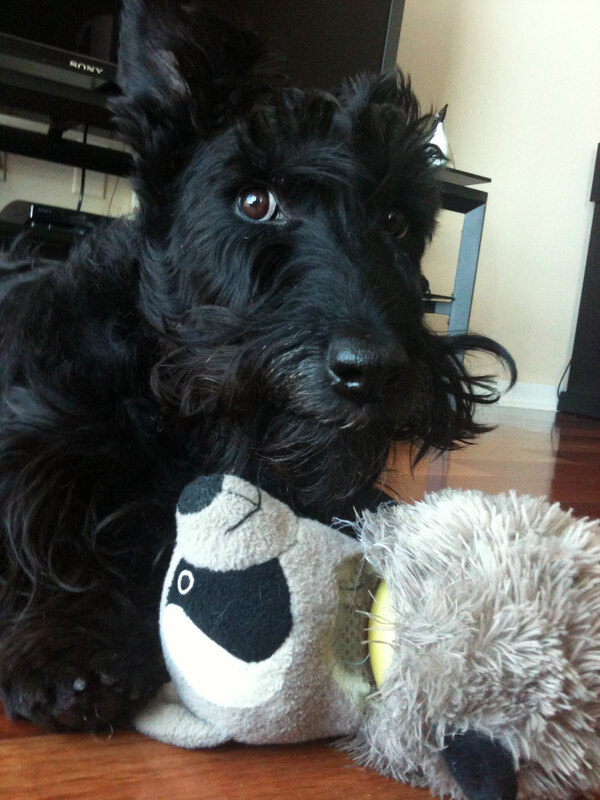 She (thankfully) loves toys made by Planet Dog, a brand that uses durable non-toxic material. awesome! Well, Winston and Finona 'share' when they have to with their younger retriever mixed brother and sister and they have kinda shown them what toys are for. Now, when their 'cousins' of yorkies come over....no toy is allowed out of their sight...the yorkies love to destroy any toy that squeaks! Chloe does well with the furry "Kong" Brand squeaky toys that have rope inside the limbs as well. They come in two sizes. there are bears, and birds. Chloe prefers the smaller size as she can carry it around with her without tripping on it. The squeaky eventually gets broken, however, the toy stays pretty much intact and she continues to enjoy playing with it. My two hellions rip apart everything, but I’ve found that the oldest one does ok with stuffed toys that have sewn or felt eyes, rather than button ones. With the buttons, she feels compelled to rip out the eyes. Once they are blind, she’s left with no choice other than to gut them. Heaven forbid they squeak, for then they must be silenced by The Terrible Twosome. Now I just use a two-ply fleece bag of my own making, stuffed with the carcasses of all the old toys with one little hole to get them out. It drives them bonkers!